We are a Cambridge Founded Food Truck providing Traditional North African, Levantine and Mediterranean cuisine! We specialise in Mouth Watering Shawarma, Homemade Falafel, Heart Warming Tagines, Finger Food like Kibbeh, Bastila and Meze and Spicy Harissa Merguez Wraps! We import all our spices from Morocco and use locally sourced produce where possible. Authentic recipes passed down from generations are the foundation for our Street Food. Flavours derived from the Sun! Karim Rerizani is the Owner and Exec. Chef at the very established family run restaurants, Bedouin and Al Casbah in Cambridge! He has now also ventured out with Bedouin Caterers. 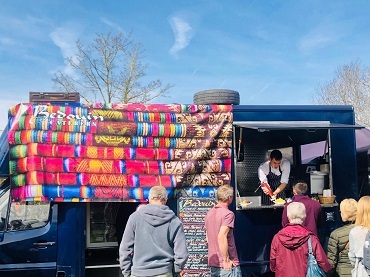 My name is Rickie Pledger and last year I launched a Street Food Van in Cambridge working alongside the ever growing outdoor film company “Enchanted Cinema” as well as other clients. This year myself and Karim and joining forces, we are very excited to be working together. Between the two of us we have over 30 years of experience providing exceptional customer service in the hospitality sector! We believe that good food has to be accompanied by great service and customer interaction. It's what we do!